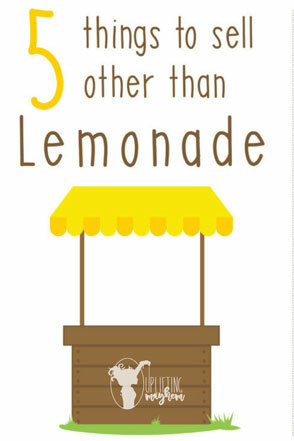 You know it’s summertime when your kids starting asking if they can do a lemonade stand. Let’s be honest, it wouldn’t be summer without a fresh cup of that golden liquid for 25 cents. But after doing a lemonade stand on the nearby corner for the bazillionth time, I thought it would be fun to mix things up for a bit. What could we sell besides lemonade? Once my kids and I started brainstorming, we came up with some pretty fun and successful ideas. Even the smallest of backyards, most people can find a way to plant a few veggies. We planted extra peas this year and they were coming out our ears. After we ate as many as we wanted, I had my boys help me pick the rest. We washed and bagged them into sandwich bags and loaded them in the wagon and off we went! Usually we would set up a stand on the corner, but it was a nice day so we decided to go door-to-door and sell our fresh peas for $1 per bag to the neighbors. Holy moly! Those bags sold like hot cakes! 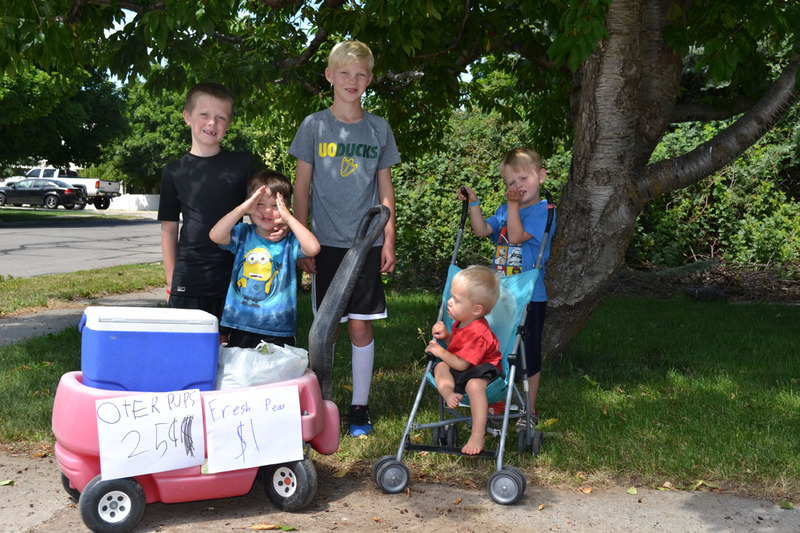 We sold all twenty bags and made $21 (the mailman gave my boys an extra dollar). Other ideas of homegrown items to sell include eggs, pumpkins, cherries, apples, apricots and corn on the cob. Okay, so my boys didn’t actually do this one. Some girls in our neighborhood created their own cupcake club. They dropped flyers off at all the houses in the neighborhood advertising a bake sale. Of course, on the specified day, we had to check it out. Who wouldn’t want a cupcake? Their cupcake stand was a hit! Plus all of the proceeds from their sales went to Primary Children’s Hospital. 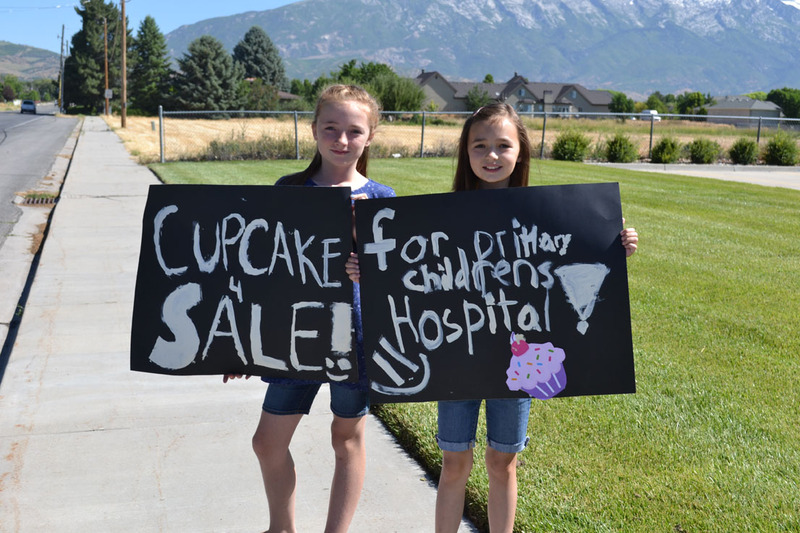 These girls were selling cupcakes out of the goodness of their hearts. Needless to say, I bought seven cupcakes. They were delicious and they seemed to taste better knowing they were going to a good cause. In the end they made $249! Here’s some fun recipes to try for your next bake sale: rainbow pretzel wands, lollipops, fruity pebbles no-bake bars. The sky is the limit on this one. Our family recently went on vacation to Mazatlan, Mexico and came back with bags full of seashells. Living in Utah, we just don’t get the chance to collect endless seashells very often, so it was a real treat. 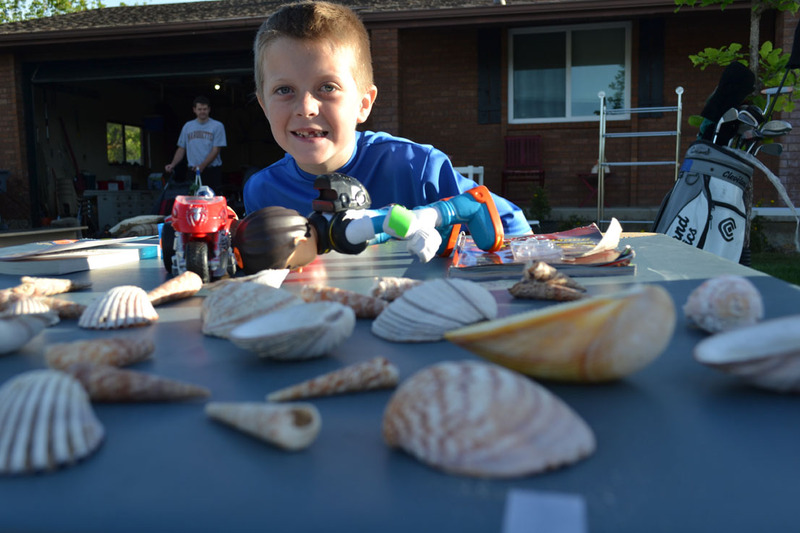 After my boys chose their favorite shells, they laid the rest out on a card table and sold them during a garage sale that we held in front of our house. If you don’t have any seashells, your kids can rummage through their toy box and pick some items to sell. Recently we were on a walk in the park and there were two little girls selling their Polly Pocket dolls and other miscellaneous toys. They were all girl toys and my boys still wanted to buy something. It was quite ingenious actually. There’s something about a little six-year-old standing on the street corner in freezing cold weather selling hot chocolate. It’s either pity or people are just really thirsty but every person that drove by stopped to buy a cup. Hot chocolate stands pretty much blow any lemonade stand out of the water. 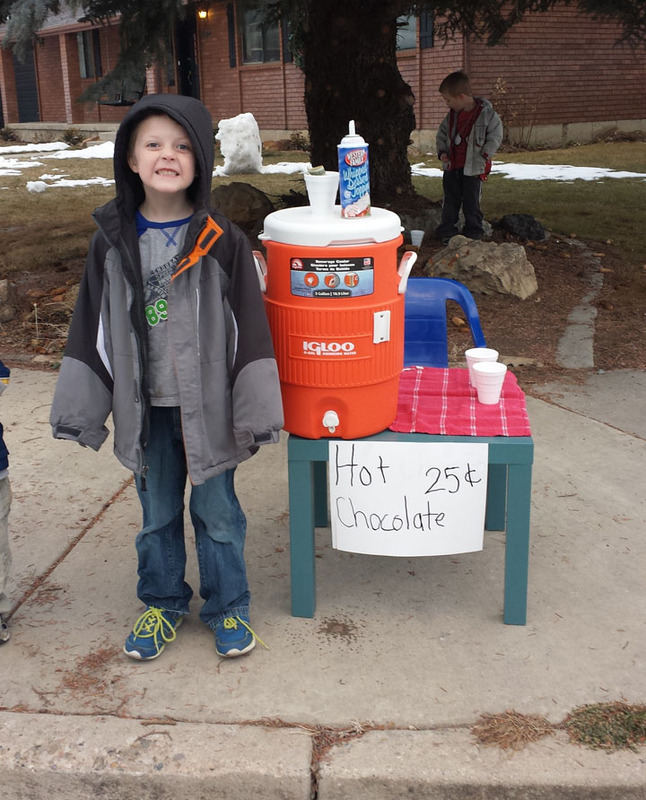 When my son begged me to do a hot chocolate stand in the middle of January, I figured, “Why not?” Within the first 30 minutes he had made $8. That’s a lot of money considering they were only 25 cents per cup. 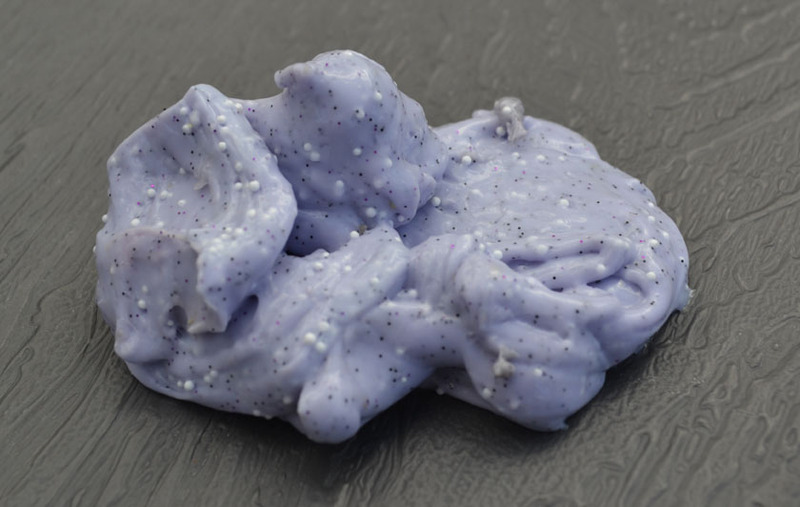 Okay, so homemade slime is totally the craze right now. I don’t know what it is. The other day when I was checking out some yard sales, two girls were selling homemade slime in their front yard. I instantly bought three containers for each of my boys and oh man did they love it. Check out this recipe and try it yourself. If slime isn’t your thing, there’s many other options such as origami, pom poms and shrinky dinks. The possibilities are endless and it’s a great way for your kids to get creative. 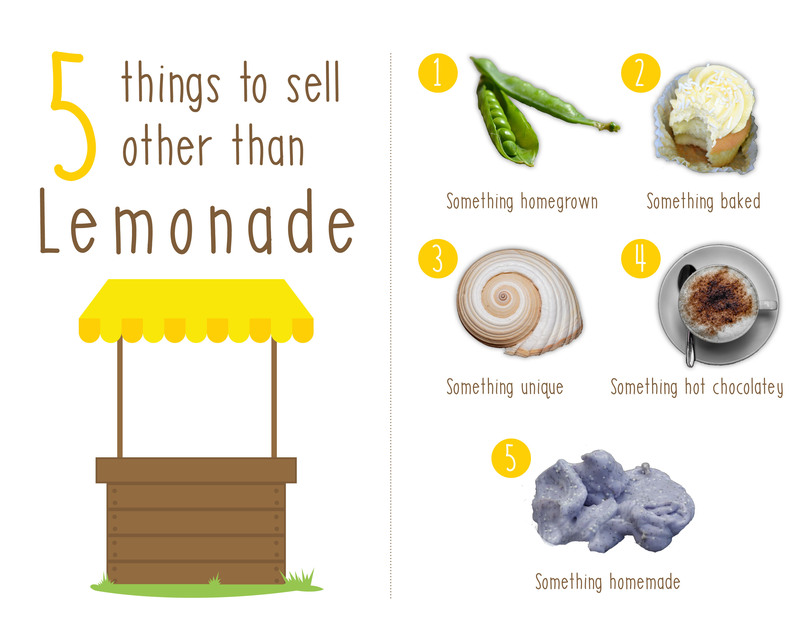 What other items have you sold instead of lemonade with your kids? Leave your comments below.